Everyone is born with certain innate talents, capabilities and strengths that make them who they are, many of which are characteristic of leadership. Be it attention to detail, critical thinking, attentiveness, or clearly explaining complicated concepts, there’s no one else quite like you, to paraphrase Fred Rogers. Leveraging your personal strengths at work often translates into higher engagement and productivity which can increase your leadership potential within the organization. In fact, according to research conducted by Gallup, employees who use their strengths at work on a daily basis are 8 percent more productive than those who don’t and 15 percent less likely to quit. No one knows you better than yourself, so you’re probably already well aware of the strengths you possess. However, the people you’ve worked with in the past, or those you work with presently may notice aspects about you that you may not recognize, said Anthony Stephan, a principal at Deloitte Consulting. “One of the best steps I took when identifying my strengths was to actually sit with the people I worked with the most closely,” Stephan told Fast Company. “Seeking out honest feedback from people you trust is always a good idea.” Candid conversations with coworkers and former colleagues can help you identify characteristics that you can hone and strengthen to benefit yourself and your employer. Strengths come in many forms, particularly those that apply in the workspace. 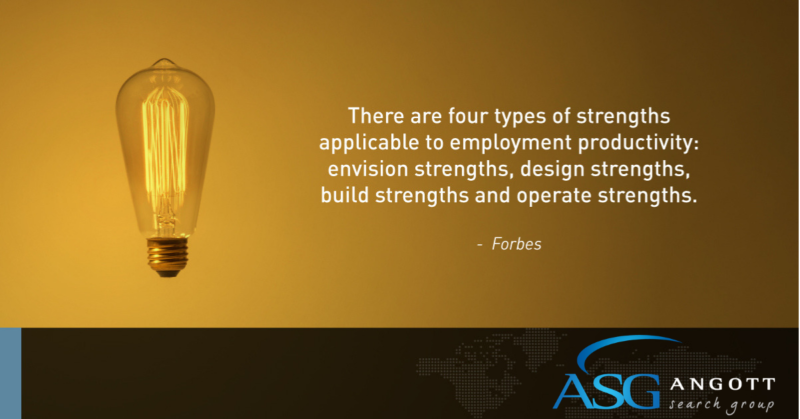 Jack Bergstrand, chief executive for a consulting firm based in Atlanta, told Forbes there are four types of strengths applicable to employment productivity: envision strengths, design strengths, build strengths and operate strengths. Envision strengths, for example, are typically found in people who thrive at problem solving, common among CEOs, strategists and marketing professionals. Design strengths are found in people who are fact based, or those who strive to answer “What do we need to do and when?” Planners tend to be particularly adept in design, making them ideal chief financial officers and analysts. People who fall in the “build” category are more process-oriented, involved with how things are accomplished. People in information technology and logistics tend to be builders, thriving with routine-centric processes. Finally, operate-oriented individuals make things happen by focusing on the “who,” both in terms of the end user and the people that create what’s produced. Sales professionals personify the operate strength characteristic. Bergstrand added that understanding these strengths, and how they apply to you, can lead to more enjoyable work experiences complemented with greater productivity and results. Since you’ve been in the workforce for awhile, you’ve no doubt experienced some accomplishments as they pertain to what you do for a living. These wins may not necessarily be those that come with pomp and circumstance, but may have been achieved behind the scenes, such as mentorship or providing feedback that led to action. Whatever you did then, apply them to now, advised Jeff Haden, contributing editor for Inc.
“Ask yourself what exactly were you doing at the time, and which soft skills you employed to help you achieve your end result,” Haden said. The hiring market is ultra competitive. Even if you already have a job that you love, employers expect you to stay on top of industry trends, and seek ongoing training to ensure you are leveraging the latest techniques to helping the company remain relevant and cutting edge. Leveraging your personal strengths in the professional arena can help you become extraordinary in your line of work, with leadership capabilities your bosses will be hard-pressed to replace.